The universe is full of things that are either too big or too small to see with the naked eye. It takes powerful imaging technology — huge telescopes or electron microscopes — to convert these objects into size we can actually comprehend. That’s why this image taken by David Nadlinger from the University of Oxford is so impressive. He took a picture of an atom using an ordinary camera, and the result is mindblowing. If you look closely, you can see a single strontium ion in the center of this ion trap, between the tips of the two “needle” electrodes. The tips of the needles are separated by 2.3 millimeters — roughly the width of a spaghetti noodle. What you’re seeing is a single positively charged strontium atom (also known as a strontium ion) suspended in electric fields radiating from the metal electrodes around it. 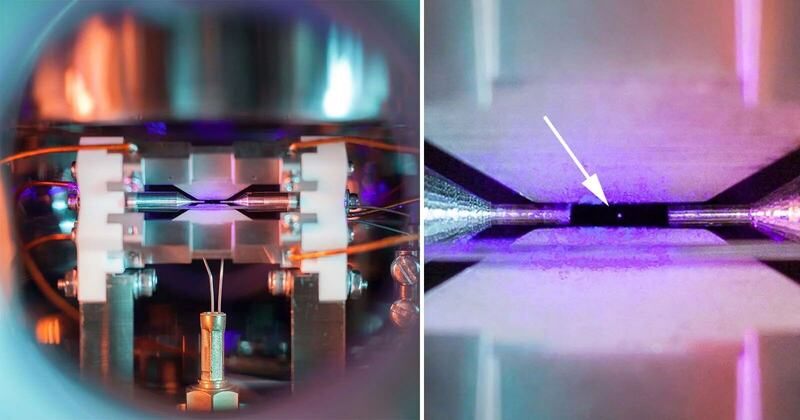 To get a sense of just how small this image is, the distance between the two needle-like tips you see is about 2 millimeters — roughly the width of a spaghetti noodle. On February 12, 2018, Nadlinger’s image won the overall prize in the fifth annual science photography competition held by the U.K’s Engineering and Physical Sciences Research Council (EPSRC). The EPSRC is the main funding agency for engineering and physical science research in the U.K., and the competition included more than 100 entries from researchers receiving EPSRC funding. There are some breathtaking images among them. “Every year we are stunned by the quality and creativity of the entries into our competition and this year has been no exception,” said Professor Tom Rodden, EPSRCs Deputy Chief Executive. “They show that our researchers want to tell the world about the beauty of science and engineering.” You can see all of the winners on the council’s website. For more beautiful images of tiny things, check out “Science Is Beautiful: The Human Body Under the Microscope,” edited by Colin Salter. We handpick reading recommendations we think you may like. If you choose to make a purchase through that link, Curiosity will get a share of the sale.